Description: The main stems and side branches of this species are robust, grey-brown in colour, and often heavily encrusted by bryozoans and foraminiferans. The main stem is unbranched with regularly spaced, alternate side branches. The hydrothecae are subalternate on both the stem and side branches and are bulbous at the base becoming narrower towards the rim. The rim is circular, with a single opercular flap. The gonothecae are generally ovate in shape and smooth to slightly rugose in texture. Fully grown colonies measure about 100mm in height. 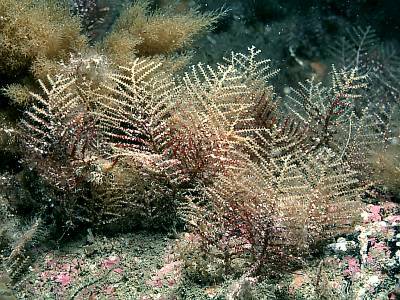 Habitat: This hydroid is usually found attached to bedrock and boulders in strong tidal streams but can also grow on shells and cobbles. Similar Species: This species is most likely to be confused with Sertularella gayi which is similar in overall size and appearance. Points to note are the alternate arrangement of the hydrothecae in Sertularella gayi whilst they are subalternate in Abietinaria abietina. Picton, B.E. & Morrow, C.C. (2016). Abietinaria abietina (Linnaeus, 1758). [In] Encyclopedia of Marine Life of Britain and Ireland.